Myanmar's State Councilor Aung San Suu Kyi, a Nobel Peace Award laureate, has been increasingly rebuked by the West due to her government's treatment of Rohingyas in the recent ethnic conflicts that have led to more than 400,000 Rohingyas fleeing to Bangladesh in over a month. She was stripped of the Freedom of the City of Oxford and her portrait on the walls of the Oxford University, where she studied, was removed. More than 400,000 people including scholars, journalists and human rights activists have demanded the Nobel Committee take back her peace prize. Her image built up by the West as a democracy icon seems to have collapsed. 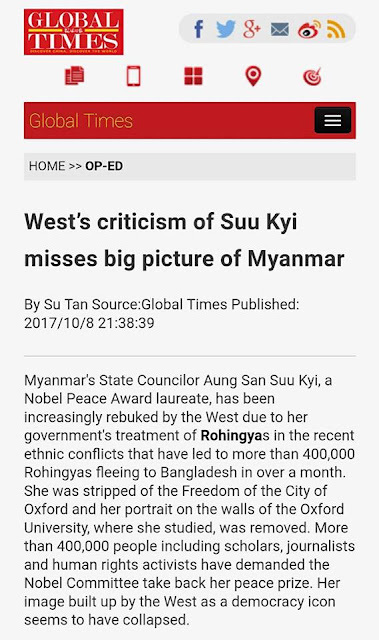 But among the tide of criticism, the enormous challenges confronting Suu Kyi have been overlooked, be it intentionally or not. She was elected to govern a country with complicated ethnic conflicts and a desperate need for social and economic development. In office less than two years, the government led by her National League for Democracy has advanced national reconciliation and promoted Myanmar's long-term development in social, economic and diplomatic fields. The conflicts between Rohingyas and local Buddhists in Rakhine state won't be solved overnight simply on the orders of Suu Kyi. Unfortunately her efforts in this regard have gone unrecognized in the West. As Sebastian Strangio wrote in The Nation, the West's anger toward Suu Kyi "seems to stem less from her actions, or lack thereof, than from her stubborn refusal to play the redemptive role assigned to her by the international community." The West has kept a close eye on the so-called human rights, but barely understands what caused the Rohingya crisis. The historical conflicts between Rohingyas and Buddhists in Myanmar are unlikely to be addressed in a short period and to tackle them needs a sober-minded leader and a great deal of patience. Fortunately Suu Kyi has so far withstood Western criticism and refrained from taking rash steps to address the crisis in a hasty manner. China is fully aware of the ethnic composition of Myanmar and has been a staunch supporter of Suu Kyi. China has proactively helped Myanmar's government deal with the crisis and aided the refugees. China also supports the Myanmar government's efforts to figure out a holistic and concrete solution to the ethnic conflicts that can prompt a national reconciliation. And China understands well that first and foremost, separation is unacceptable for Myanmar. For the moment, what the international community needs to do is definitely not bash Suu Kyi but instead facilitate the Myanmese government to work with Bangladesh on enhanced communication and humanitarian rescue. There should also be international assistance for Myanmar's efforts to combat terrorists that triggered the latest violence on August 25. Myanmar needs genuine support rather than purposeful idolization.